Working with paper doilies is fun, especially when the end result is a sachet as pretty as this one. If you don’t have a rose patterned rubber stamp, consider decorating the sachet with rose decals or stickers, or one of the many floral scrapbooking embellishments currently available in most bargain stores. Rubber stamp images on each of the two round paper doily with gold ink. Allow the ink to dry. Using colouring pencils, colour the rose and leaf areas of the stamped images. With wrong sides of the paper doily together, glue together around the outer edge, leaving an opening of approximately two inches. Allow the glue to dry completely. A glue stick will work for this as well as any clear drying craft glue. Spray a few cotton balls with cologne or add a few drops of essential oil. Place the cotton balls inside the doily sachet and glue the opening closed. Using a gold paint pen, paint the complete outside edge of the doilies. Be sure to paint both sides of the sachet edges. Fold an 8 1/2 x 11 inch sheet of card stock in half lengthwise [your folded sheet will measure 8 1/2 x 5 1/2 inches]. Position a large square doily onto one side of the folded card stock, so that one corner edge extends up over the open folded end of your card stock. This corner will be your envelope flap [see photo]. 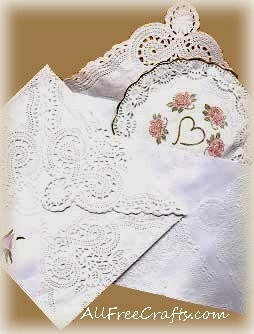 Glue doily in place onto the card stock, folding corners of doily to opposite side of envelope and secure with glue. It may be necessary to trim corners that overhang the envelope.